Earlier this year I created a set of bespoke watercolour illustrations for Cassie at Bella Vita Tours inspired by the vibrant colours of an antipasto platter and the vintage style caravan trailer. 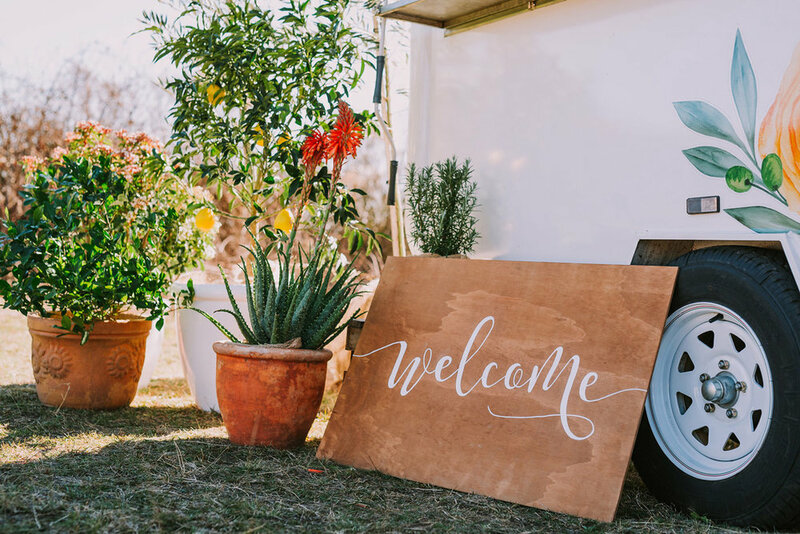 I loved working on such a beautiful brief and I wanted to showcase how this trailer would perfectly suit a beautiful outdoor wedding. 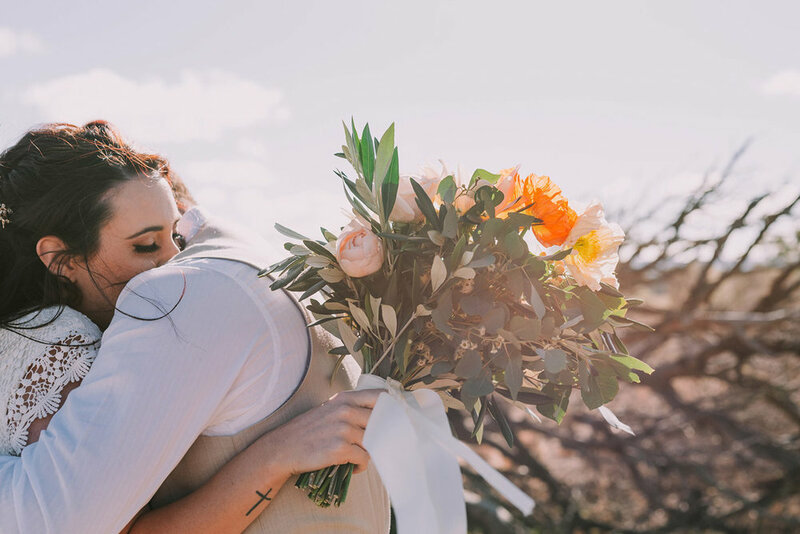 Thanks to my team of wonderful and talented creatives we collaborated to make some inspirational magic for those couples planning a relaxed and pretty Australian/Italian style country wedding. The style of the shoot is pretty and romantic with a relaxed boho vibe. Watercolour textures, beautiful florals and classical undertones form the basis for an Italian long lunch in an Australian rural setting. I used a colour palette of cream, deep peachy pinks, lemon and orange tones with the olive colours of the Italo/Australian landscape I was inspired by. These colours are also reflected in the tones of the antipasto platter that was an initial inspiration point for the design also as well as a feature for the bridal lunch itself. The Bella Vita Photoshoot is photographed by Dan from Angus and Porter Photography and styled by Elizabeth of ELK Prints. For the main table I chose a natural silk runner in cream to soften the edges of the raw timber trestle table, white marble platters and beautiful pink crystal glasses to capture the essence of classical romance. Foliage branches, flowers and the hand-painted watercolour stationary added depths of colour and texture. For the tableware I chose to use some beautiful cream rustic style plates with feature plates for the bridal couple to use, the gold cutlery added a little touch of luxury and decadence suited to a wedding event without overpowering the overall look. The overall aesthetic we were trying to achieve was for that balance between casual relaxed boho and elegant classical romance so balancing elements like the trestle tables with formal diningware helped to achieve that. Hand-painted watercolour wedding luncheon menu by ELK Prints. 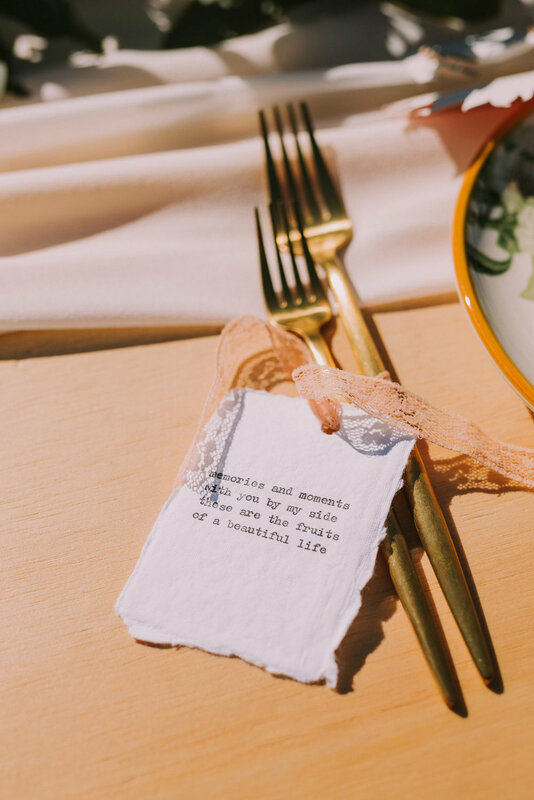 Each place setting was finished off with a custom bespoke poem that told the love story of the bridal couple. A jar of olives makes the perfect thank you gift for wedding guests. For favour gifts guests would be given a jar of olives as a reminder of the event with a special thank you note featuring the same floral sprays from the main invitation. 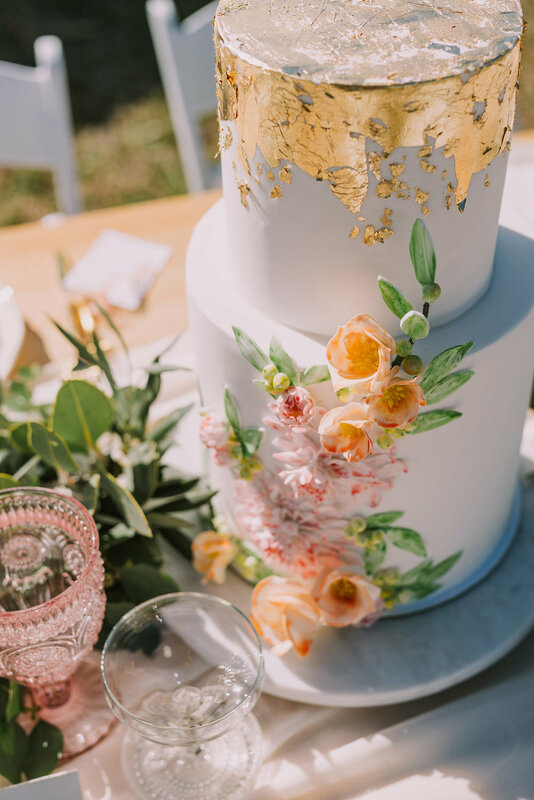 The cake design features sugar flowers reminiscent of the trailer decals and invitation design and also has just that small touch of gold to tie it together with the rest of the table setting. We wanted the day to appear very intimate and loving and suggest how the guests and bridal couple may experience those moments together. The trailer van was embedded into the landscape courtesy of the pop up green garden of lemon and olive trees with other Australian native and Mediterranean inspired plant choices. 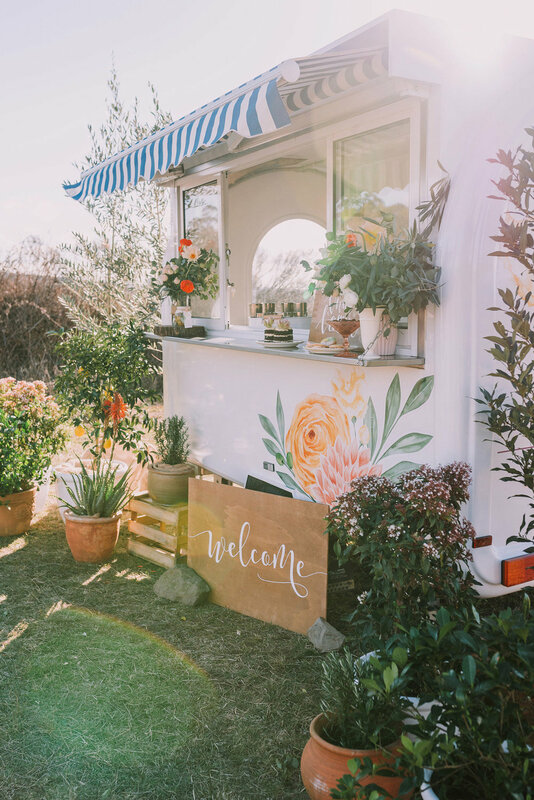 Flowers on the trailer serving table also help to blend the van together with the landscape whilst the hand-lettered signage by Lara helps to define the event as a day for love and family. Our bride and groom are dressed in a casual relaxed manner with just a hint of classic formality to their attire (waist coat but no jacket). The crochet lace of the wedding gown in particular captures that spirit of tradition through the material whilst the style and comfort of the dress gives it a contemporary feel. Her look is breezy and romantic, her hair tossed in the wind as she is swept up in the romance of the day. The groom meanwhile is dressed in cream and earth tones to suit the dry Australian landscape of their wedding day. In planning this styled shoot I started with the colours and style of the Bella Vita Bar that we would be featuring. Watercolours, florals and a relaxed Italian vibe were the main starting point. Bella Vita means ‘Beautiful Life’ in Italian so this concept became the very heart of our creative efforts. The Bella Vita Bride is romantic and free-spirited. She has a light-hearted breezy attitude to life and adores pretty things. She is feminine, vibrant and bubbly. She likes Prosecco the best because it has all the sparkly fun of Champagne without the snobby attitude. She loves the classics and has a deep respect for family and tradition. She loves an authentic home-cooked meal and the simplicity of sharing a great cheese board with others. She is sociable and warm-hearted and prefers to surround herself with laughter and friendship. Home is important to her but she also loves to wander. A perfect weekend is spent exploring the countryside with her fiancée wandering through fruit orchards, trying the local produce and enjoying long lunches overlooking the rolling hills. She loves nature but prefers meandering through fields & gardens than climbing mountains. Her favourite travel destination is Italy, she loves the simple pleasures of a bowl of pasta and a cone of gelato. She loves the history and traditions of Italy and she loves the elegant fashion. She dreams of the breezy coast of Sorrento, romance on the canals of Venice and wandering across the fragrant hills of Tuscany. She would quite like to dance barefooted at midnight in the Trevi Fountain. She is a bit of a day-dreamer and is thrilled by a bold romantic gesture. She wants her wedding day to be relaxed and care-free, beautiful and stylish, classic and natural. She would be horrified if anyone called her a Bridezilla and she is not impressed by excessive bling! She would like a small wedding and is planning a simple affair shared just with those people closest to her. She would like her guests to remember the wonderful food, dancing and joy they felt. Beauty for her is as much an internal quality of spirit as it is an external quality to be admired. Beauty comes from a loving heart and a generous smile. Beauty comes from appreciating and respecting the time and skills of others. She believes in living a “beautiful life”. Daniel Cheung from Angus Porter Photography appealed to me as a photographer as he has a natural down-to-earth personality. He engages with his clients in a friendly manner and prefers to take candid shots with minimal posing. The vision for Bella Vita was to create that relaxed friendly atmosphere, a simple country setup with well-chosen meaningful details. Daniel brought a great energy to the shoot with his bubbly personality and a hint of cheekiness. I was definitely struck by how genuine his approach to photography is and I think being able to connect on a personal level is important. His photographs are beautiful because he understands that the event itself is the most important aspect of the day and that his role is to capture that as opposed to direct it. I am ELK and I am a graphic designer and watercolour illustrator and am passionate about creating beautiful events. A party is a celebration of the moments that matter most to us. We gather together with those we love to mark milestones, achievements and life itself. It is a moment of positivity - embracing the happiness, laughter and warmth of the people who matter to us. I love designing for events, taking a theme and creating remarkable interpretations that delight guests. From the initial invitation that evokes excitement and sets the scene through to decorations that make your heart flutter and create the perfect ambience I work with my clients to make their event truly special and memorable. I believe strongly in creating original work designed uniquely for you. Most of my work is hand-painted as I believe in the special quality, vibrancy and tactility of the paints themselves. Cassie has a deep love of good food and produce, she learnt to cook from her Nonna and those traditions remain strong for her. After exploring the world and enjoying the city life she has returned to her home town of Griffith where she is now sharing that passion for food and wine with locals and visitors running tours of the food and wine district alongside cooking classes and other events. Earlier this year I was approached by Cassie from Bella Vita Tours to design some decals for a new food trailer bar concept she was planning. She wanted something pretty to transform the retro style trailer she’d bought into something beautiful that reflect her brand and would look perfect serving at weddings. In designing for her I took my inspiration from a variety of beautiful flowers and the vibrant colours of an antipasto platter and set about bedecking the trailer in sprays of watercolour florals. As stylists themselves I know I could trust Kat and Dani to deliver and injection of beautiful floral styling to the shoot. Limited by the winter season they managed to curate a celebration of floral beauty and variety that reflected the style and spirit of the original watercolour decals. In respect of our Australian setting native leaves have replaced the olive brances of Italy and set the tone for our Aussie/Italo love match. An abundance of florals was key to capturing the beautiful spirit of this event and I love how there are so many different specimens layered together. I instantly loved the concept of Pop Up Gardens when I first met Emilie and Iain. The idea of using real living plants to add a splash of life and greenery to an event absolutely appealed to me. Authenticity is very important to me and fake flowers and fake plants have always failed to impress me. I love that they come to you with a trailer filled with olive trees, lemon trees, shrubs, herb pots and other beautiful plants. The instant garden they set up was perfect. There is something truly lovely about having real plants to engage with - they add a dimension of scent and touch for guests to engage with. Their work truly celebrates the beauty of our natural environment. When looking for the perfect Bella Vita dress I wanted something that would perfectly balance the classical values of my bride with a breezy bohemian carefree spirit. I really appreciated the selection that Amy from Love Marie Boutique has carefully curated for her brides. She has created a beautiful private space for brides to find their pefect dress and she definitely has an eye for elegant yet authentic gowns. Of her selection I was drawn in particular to the more non-traditional boho style of the Daughters of Simone dresses she stocks. The crocheted lace of ‘Lilah’ struck the right balance between traditional values of family as encompassed in the Italian spirit with the relaxed attitude of the Australian spirit. This was a dress that is beautiful, carefree and yet perfectly in sync with the heart of tradition. I was very grateful to have Emma on the team to transform our model into a beautiful blushing bride. The Bella Vita bride has a breezy care-free attitude to life and the hair and makeup choices needed to reflect that. Emma was able to balance that classic meets natural aesthetic and create a look that suited our romantic outdoor wedding. Emma’s approach to makeup is to create a natural look, delicately layering soft contours to create a style that will feel comfortable and last for the entire duration of the event. She believes in enhancing each individual’s unique beautiful features and celebrating those details. The concept of the “beautiful life” was one that really resonated with Simona as she started Simona Bridal with one goal in mind - to curate the most beautiful pieces from around the globe and help brides incorporate them into one of the most important days of their lives. From the iridescent lustre of freshwater pearls to the dazzling beauty of Austrian crystals, she has always had a love for exquisite pieces created with skill and passion. Simona certainly does spread a little sparkle and beauty with her pieces and thinks carefully about how they will be a treasured keepsake for her brides. I chose the Kamille comb from her selection as I loved the spray of leaves and budding blossom flowers. It definitely captured the boho abundance of floral beauty of Bella Vita. Our models for the Bella Vita photoshoot are a real couple, Ami and Stephen, who have been married for 7 years and have two boys. Ami absolutely loved the idea of being able to step away from all that masculine energy in the house. To spend a day together reminsicing about their own wedding day and being able to take that time out just to be together and embrace their love was something special for them both to do. It was lovely to watch them settle into the landscape we had created and enjoy each others company. It was important for us to chose a genuine couple whose authentic love for each would resonate through each image. When I look for vendors I am always drawn to those who care deeply about the artistry of their trade. Who are inspired to develop their work and care about the finer details. When I met Priya from Sugar Pot I recognised this quality in her and her passion for creating beautiful cakes. I love how she also thinks about the flavour and taste of her cakes, that the cake must be as delicious as it looks. Priya’s cakes are all baked from scratch using proper butter, real chocolate and eggs without any shortcuts or artificial additives. Beauty truly does comes from within and isn’t just some pretty decorating finishes - though she does create some very pretty finishing details to her cakes as well - perfect to look at as well as to eat. I commissioned Lara to create a custom sign for our shoot, “Viva l’amore” - Long Live Love. Lara’s calligraphy skills are exceptional and her approach to typography is truly beautiful. Lara is a true artisan, starting with a pencil and sketch pad she composes her pieces carefully finding the best combination of flourishes, swirls and layout. Each piece is then hand-lettered and the signage she makes is perfectly elegant and beautiful. When I met Charlie Robbins I was intrigued by her bespoke poetry service. It is such a special idea to write a poem that reflects the personality and character of each individual love story. A custom poem is a perfect addition to a wedding, through the words written guests gain an insight and understanding of the couple. To read the words is to know how that love feels and what makes that particular love story so special. Charlie types out all her poems by hand onto beautiful cotton-rag papers from Peter Kin. Her service is truly a unique offering. I love the beautiful selection of glassware and tableware stocked by Pretty Pedestals. Lisa has gathered together such a wonderful array of unique quality pieces. You can see the love she has for interesting textures, intricate details and beautiful colours. The Bella Vita photoshoot was setup at Oakham farm in Marulan. I love the idea of a long Italian lunch, Australian style. Long timber trestle tables with simple white folding chairs set out in the fields for family and friends to gather together and feast. The idea of sharing a feast together is tuly a universal moment across all cultures - it connects us together. Minnie started her hire business based on the passion and love of her family. Inspired by the weddings of her two daughters she set about gathering a collection of pieces that could transform a simple backyard into a magical setting. As a creative designer I am a little bit detail obsessed and one of my quirks is that I do tend to over-think the finer details at times. The ‘menu’ I wrote for this event is a particular example of the way my creative mind thinks deeply about everything I design. Every dish listed on the menu is inspired by the regional cuisine of the Le Marche region in Italy. This region is known as the middle region that links together Tuscany and the Veneto (Venice) regions - definitely two of the most romantic regions of Italy. Focusing on the connecting link between them seemed like a nice reflection on what a wedding is - the forging of a permanent link between two people in love. Each of the menus are individually hand-painted with watercolours and die-cut by hand also. I love the authenticity and pure beauty that the original painting has. It is tactile and the colours have a depth that is not quite the same when reprinted with a mere 4 inks from a computer. Thank you for your time in reading about our photoshoot and I hope you loved learning about all the special creatives and details that were involved. Hopefully you find some inspiration to enjoy and live life in your own beautiful way.